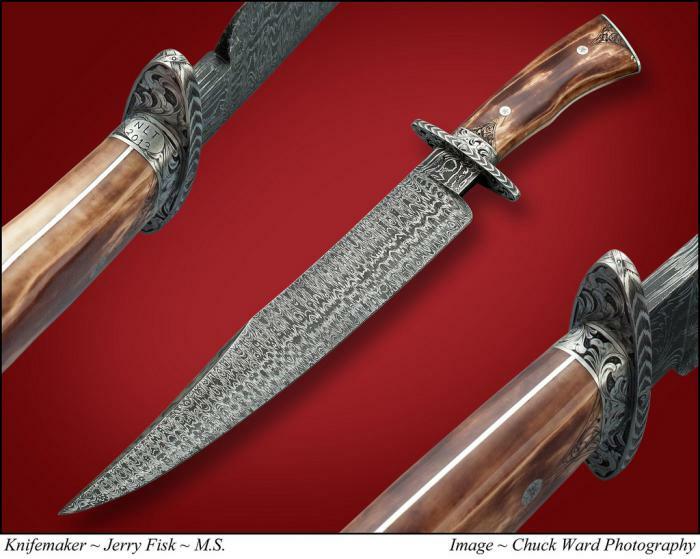 THIS KNIFE WAS SOLD AT THE 2013 MICRO SHOW. I LEFT IT HERE SO THAT YOU CAN SEE AN EXAMPLE OF SOME PIECES THT WILL BE AT THIS SHOW. FOR MORE INFORMATION PLEASE GO TO THE MICRO SHOW LINK BUTTON. I like the Southwest bowies above all bowie styles. The work well in the field as they have a good balance and weight to them. This bowie has some of the best engraving I have done to date. Once you put it under a eye loop you can see the details better. I have over 100 hours engraving time. I will explain this at the show, of what and how to look at engraving. On this one I even engraved the ivory which is something you see very little of out there. I try each year to offer my best work of the year at this show and this knife is something I think you will be proud to own.